UPDATE COMING SOON: Upgraded Sound Engine, Upgrade Gamers Zone. Another great classic gameplay of the widely played 4 card keno. Play 1, 2, 3 or 4 cards at the same time. Choose different numbers or the a combination of the same numbers. Great game for everyone. 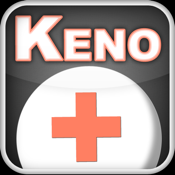 If you like to play video Keno or even have our DAKeno app already, this is a great addition to your device. Bet from 1 - 16 credits of a max of 4 credits per card. Choose from 2 - 10 numbers per card. Game starts with 400 credits, run out of credit, don't worry you will be provided with another 400 credits to keep going. DAKeno Plus features many of the great features in DAKeno as well as many new. - Slide over numbers to pick. - Quick Stop of Payout. - Game completely saves all information. Leave the game or answer a call. Your numbers are stored and recalled when you start back up. Game interrupted during a play, don't worry when you come back you will receive your credits from the game that was in progress. - Ran out of money? The game will now let you know so when you receive more credits you can make sure you continue betting MAX. - Gamers Zone Integration: Register and Update your account information and avatar. - Fixed a minor error that may cause the app to crash when switching between the jackpot board and the game itself. - Better audio support: Sounds are now controllable when playing music. - Modified new credits to be added when credits drops below 16 rather than when it reaches 0 allowing games to be played up to 16 credits at all times. - Better indicator when a card is not played. - Added in Help what the C B M H abbreviations stands for. - Extra speed option, now play even faster.